10 a.m. to 5 p.m. – Trees and Trains – several decorated trees and new exhibits including the Merrickville pass and station. No charge, handicapped accessible, refreshments. 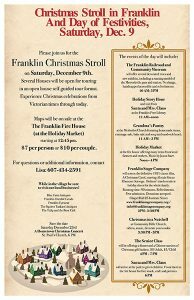 The Franklin Railroad and Community Museum, 572 Main St.
10 a.m. to 5 p.m. – Decorated trees – Cookies, cider, and hot chocolate. Rich Farmhouse Community Center, 574 Main St.
3:30 p.m. – 5:00 p.m. – “Christmas in a Nutshell” Open House – short Christmas videos, decorate your own cookie. Community Bible Church, 89 Center St.
Other dining in the village: The Tulip and The Rose Cafe, 435 Main St.
All venues are handicapped accessible except for some homes on tour.